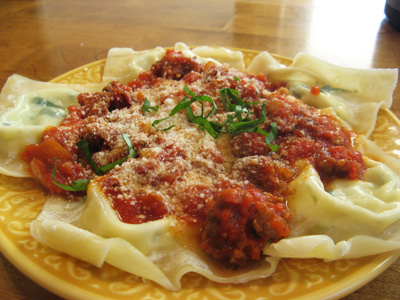 One of my favorite things to make is ravioli. And you would be surprised at how easy they are to make if you have a little time. I had a day when everyone was gone, the sun was shining, and I had hours to kill. So I made a quick trip to the store, picked up won ton wrappers, 4 different cheeses, some spinach and I was ready to go. I knew these would go fast so I doubled the recipe so that I could put some aside for another meal. I thought a spicy sauce would go great with the ravioli and decided on Italian sausage and crushed red pepper to spice it up. The guys were so hungry when they got home and the ravioli disappeared quickly, but I had the best day. It was so much fun putting these together, sort of like a craft project. It tasted so good and was pretty on the plate. I love it when that happens! 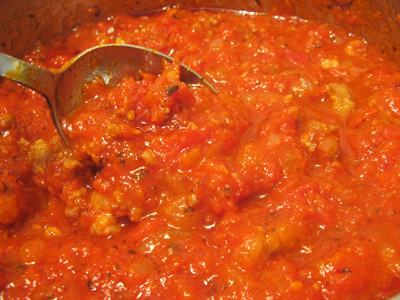 Start with the sauce, that way it can simmer on the stove while making the ravioli. 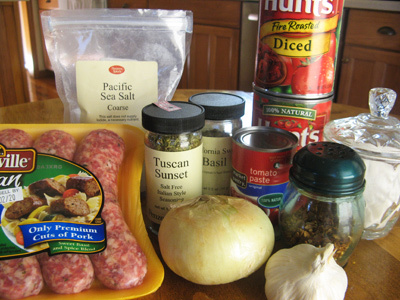 I used 2 cans of fire roasted tomatoes, a half can of tomato paste a whole onion, 2 cloves garlic, 3 links of sweet Italian sausage, basil, Italian seasoning (Tuscan Sunset), basil, salt, sugar and crushed red pepper flakes. 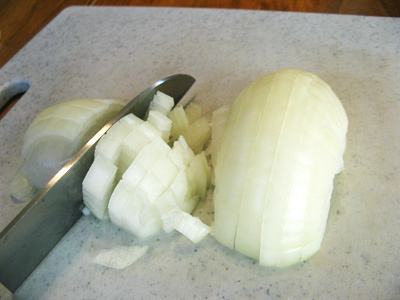 I used a small dice for the onion. And used a larger grate for the garlic. 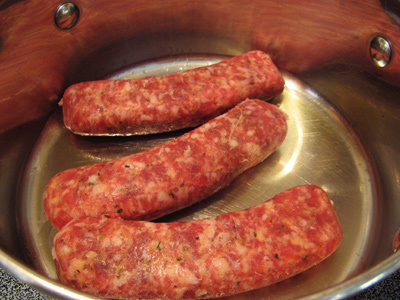 I drizzled some olive oil in a medium saucepan and added 3 links of the sweet Italian sausage. Break it up and when it starts to brown, add the onion and garlic. 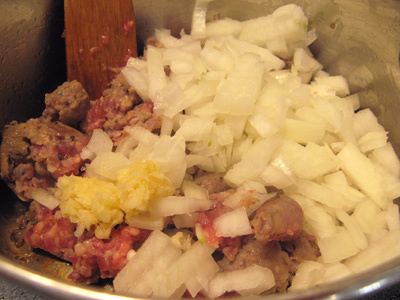 Stir it around and continue to cook over medium heat until the meat browns and the onions and garlic soften and become translucent. I ran the tomatoes through the food processor until they had that crushed tomato look. Add them to the meat mix. Time to spice it up a bit. Add a teaspoon of sugar, 1/4 teaspoon salt, 1 teaspoon dried basil, 1 teaspoon Italian Seasoning, and 1/2 – 1 teaspoon crushed red pepper flakes. Now give that a stir. 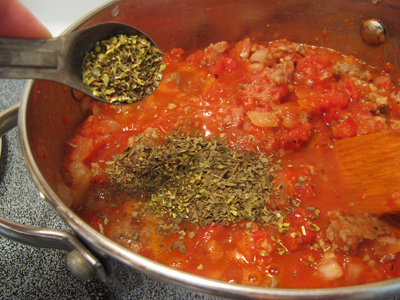 The sauce is a little thin so I added 1/2 can of tomato paste to thicken it just right. The sauce is just the right consistency and the spices are just about perfect. At this point I put the lid on it and turn the heat on low to simmer while I make the ravioli. 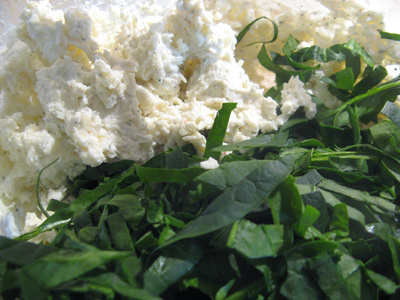 The filling consists of cheese, cheese and more cheese, plus a little spice and spinach to round it out. I let the cream cheese sit out to room temperature, then placed it in a mixing bowl along with the other cheeses, add a teaspoon of Italian seasoning and mix that all together. It only takes a few second and much easier than mixing by hand. You can add as much or little spinach as you want. I ran a knife through 2 cups of spinach and added into the mixing bowl. 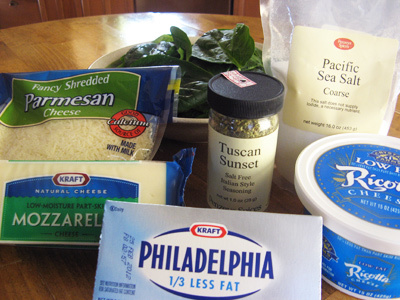 Turn the mixer to low and mix just until the spinach is spread evenly through the cheese. 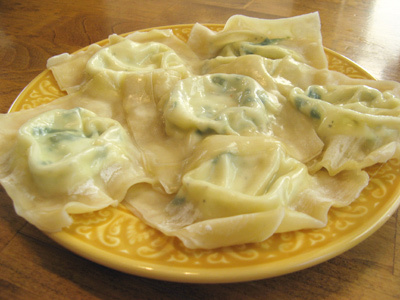 I beat an egg in a small bowl and brushed the egg wash around the edges of the won ton wrappers. Then I scooped about a tablespoon size dollop of cheese mixture to place on the won ton. 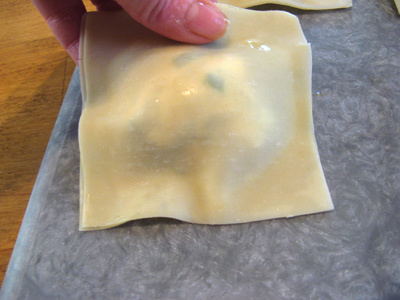 Press the edges together with your fingers until all the air bubbles are out and the ravioli is sealed tight. I made a double batch because I wanted to make enough for tonight and enough to put aside for another meal. I made 48 ravioli but the recipe is easy to divide in half if that works better for you. 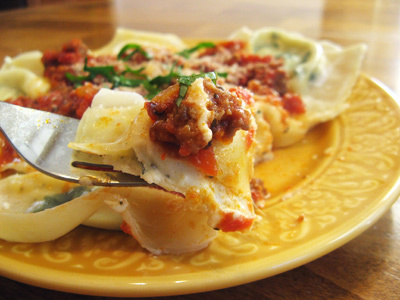 I’m going to try something new with the ravioli I put aside and promise to share once I put it together. So stay tuned . . . Okay, you can cook these 2 ways. I like to place them in a food steamer for 10 – 12 minutes and they come out perfect. But if you don’t have a steamer, they can be dropped into boiling water for 3 minutes, a few ravioli at a time. If boiling, make sure to watch that the cheese doesn’t start to leak out. 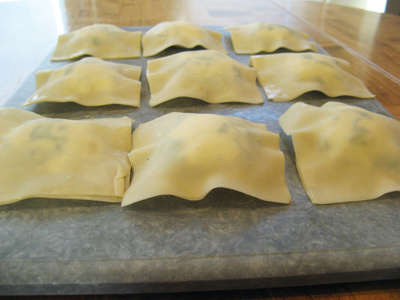 Remove them with a slotted spoon and place on a warming plate until all ravioli are cooked. These came straight from the steamer. I can’t wait to take a bite of that yummy cheese filling. Add some of that spicy sauce over top that’s been simmering on the stove. You just gotta try these, they are sooo good! 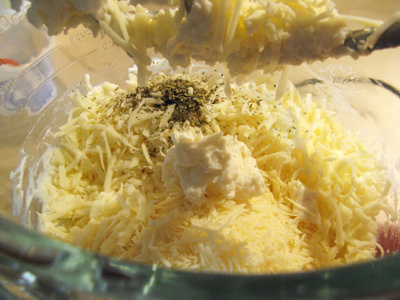 Combine cheeses in a mixing bowl and blend on low speed. Add Italian seasonings and chopped spinach. 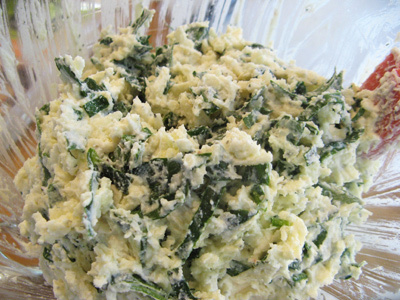 Blend just until the spinach is blended throughout cheese mixture. Take 2 won ton wrappers and spoon 1 tablespoon dollop onto one of the wrappers. Brush egg wash around edges and gently press together with your fingers sealing the cheese filling inside. 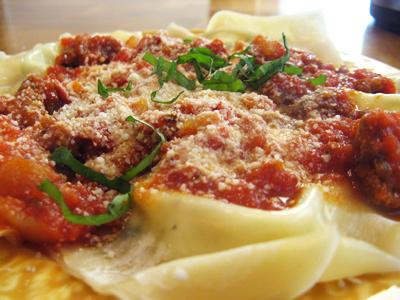 Make a single layer of ravioli and place on wax paper on a cookie sheet. 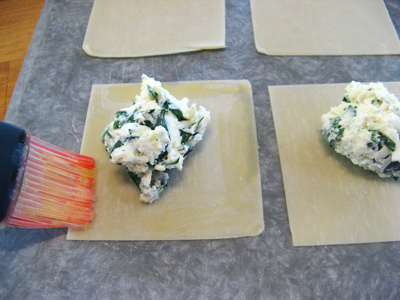 When you have enough to fill the sheet, place another layer of wax paper before you start the next row of ravioli. This will keep the ravioli from sticking together. 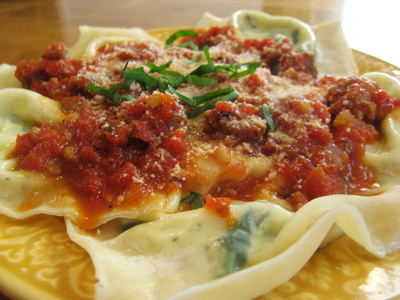 Steam or boil ravioli: If using a food steamer place ravioli single file in steaming crate and steam 10 – 12 minutes. 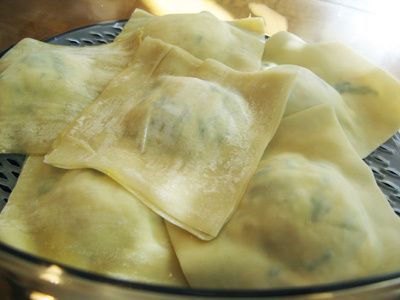 If boiling, place a few ravioli at a time into boiling water for up to 3 minutes. You will have to do this in batches. Makes 48 ravioli. Heat a medium sauce pan over medium heat. Drizzle olive oil and add 3 links Sweet Italian Sausage to the pan. 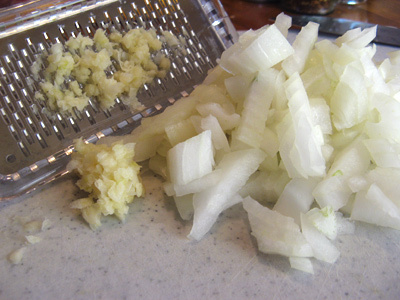 Break apart links and when they have started to brown, add diced onion and garlic. 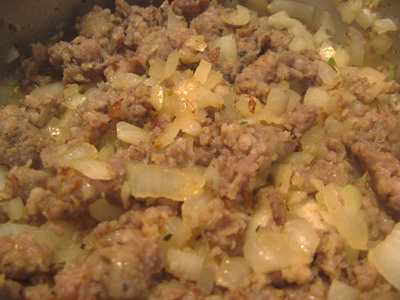 Stir contents together until sausage has browned and onion and garlic are soft and translucent. 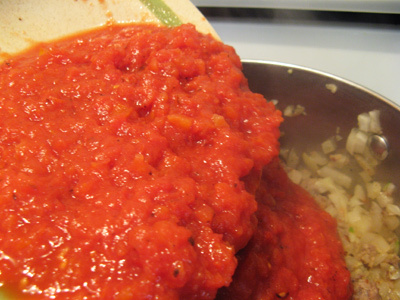 If desired run canned tomatoes through a food processor. 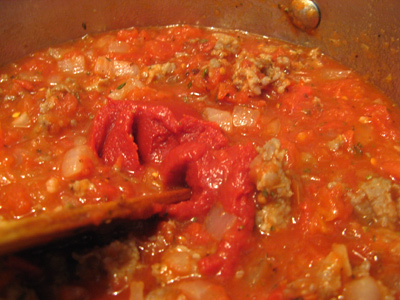 Pour crushed tomatoes into pan with sausage mix. Add the spices and 1/2 can of tomato paste. Stir together and turn heat to low. Place a lid over the pan and simmer until ready to use.